With 2012 being the Queen's Diamond Jubilee year, we thought it only fitting to include some Commonwealth destinations in our tour programme in honour of the royal milestone. It is an opportunity to explore the far reaches of her kingdom! Our tours to India and Australia are currently taking place, with record bookings. But you still have the chance to join our escorted rail tour of Western Canada in June – an 18-day epic journey to some of the most stunning places in the world. You can celebrate the Jubilee celebrations at home before embarking on this trip of a lifetime on 18 June, packed with fabulous railway journeys through spectacular scenery and including safari excursions offering close encounters with the wonderful wildlife, including grizzly bears. Our rail route begins and ends in Vancouver and travels through lush forests and dramatic coastline, which serve as natural habitats to porpoises, seals, blue heron, bald eagles and the world's largest concentration of grizzly bears. We spend a day taking an Inside Passage Cruise to get a closer look at the wonderful marine wildlife. Travelling on VIA Rail's Skeena train from Prince Rupert to Jasper through awesome scenery, we move eastwards towards the magnificent Rockies passing Mount Robson and the Yellowhead Pass flanked by tranquil mountain lakes. A highlight excursion will be the magnificent Maligne Lake and Canyon – the natural beauty of which will take your breath away. Still ahead are waterfalls in the Athabaska Valley and even a glacier at the summit of the Columbia Icefield! 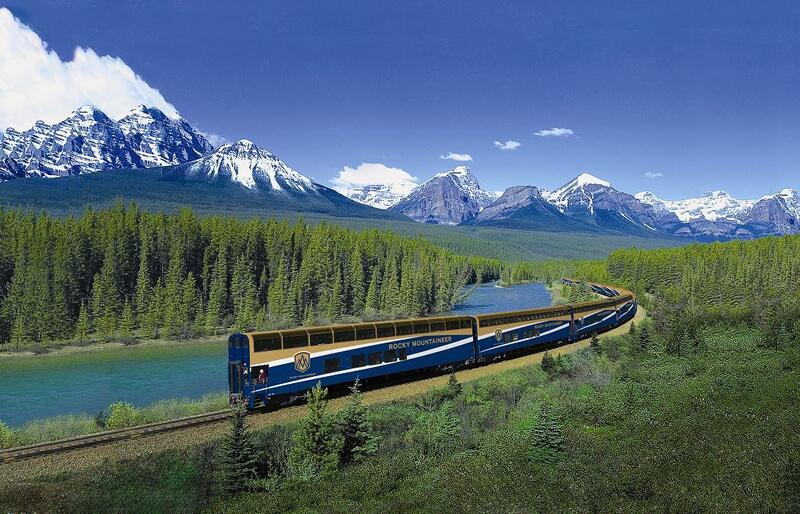 If exhausted by all this raw splendour you can relax on the world famous 'Rocky Mountaineer' train as we leave Banff for a two-day journey to Vancouver. It's not only the scenery that will impress you on this tour - the pioneering excellence of the railways, that give access to such isolated magnificence, is also quite remarkable. The length and cost of this escorted holiday (£4,695pp) has been planned to ensure you get the most out of this 'Grand Tour' at a relaxed and leisurely pace. It includes accommodation, all rail journeys and wildlife and scenery excursions. Add in the expertise and passion of our tour leader and the convivial company of fellow travellers to make it an 'Unforgettable Rail Journey'. Please contact Emma Griffiths via email on emma.griffiths@ffestiniogtravel.co.uk or call on 01766 772030 to talk in detail about this tour. The full itinerary can be found in our 2012 Brochure or on our website at www.ffestiniogtravel.co.uk. We look forward to hearing from you.